Springing from the endless runner genre that has saturated the tablet and phone market, Infinity Runner tries to upscale that success for the PC. Using a first person perspective it does a great job of replicating the high speed, high risk nature of running for your damn life but the lacklustre visuals, wobbly voice acting and repetitive nature of the genre get tiresome very quickly. Have you ever run for your life? I have. The way the adrenaline courses through your body, focussing the mind on pure survival, pushing power to your legs and lungs like a drag racer pumps fuel to its boosters and ignites the car in a fiery explosion. Ok, so I was “only” running from a herd of rampaging cows but that’s how an endless runner on the PC should feel to me - an immersive, hair-raising experience that has you running from something terrible, something so vile and evil that you would run forever to keep away from it. Infinity Runner is not that game and its appearance on the PC feels odd and out of place. The throwaway nature of the endless runner genre with attention only needed for a few minutes or seconds doesn’t seem to translate well onto the desktop space, where less intense pleasures like Peggle or Bejewelled fill the five minute chasm between work emails. However, Infinity Runner strikes a darker vibe than most other endless runners and gave me hope that my traumatic near-death bovine experience was to be replicated here. With its homage to Alien’s Nostromo prevalent in its murky corridors it certainly seemed to be heading that way. Part of this hope was with the first person perspective adding a unique twist and making the experience of running through endless corridors feel faster than any other title in the genre and best suited to PC gaming. Though it produces a great sense of speed the basic design of the genre quickly comes though and Infinity Runner reverts to being as repetitive and shallow as most other endless runners. Every few corridors you’ll encounter guards which you despatch via Quicktime Events but any mess ups mean instant death. The same zero-tolerance approach to mistakes applies to all hard objects in your path, though a checkpointing system keeps your progress as long as you don’t expend all your lives. 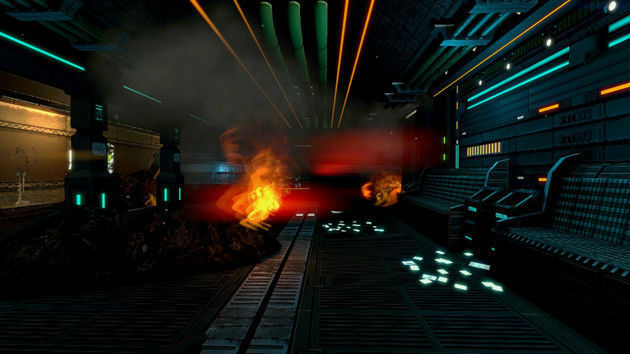 Laser traps force you to jump or slide, taking away health if you stray into their beams or mistime your parkour. 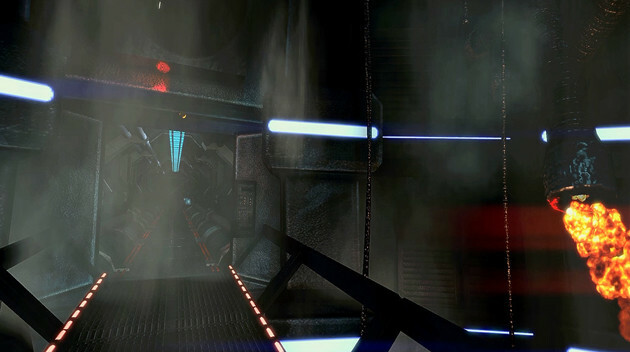 Other obstacles like chasms filling with deadly plasma or falling bulkheads add to the challenge and often require well-timed reflexes or trial and error to get past. That’s the nature of such games and you’ll find yourself slamming into walls, flying debris and meeting an end quicker and more regularly than you’d like. I expected this mechanic but Infinity Runner’s tutorial annoyingly slows down the action when you first encounter these threats, encouraging you to slide or jump way too early, leading to an unnecessary first death. I understand it’s trying to help you but it feels like an aspect of the game that wasn’t tested much, leading me to have less faith in the rest of the game. 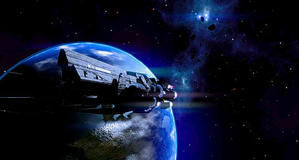 The ship has a number of sections for you to run through but the visuals never really get above sub-par to give you a sense of atmosphere or identity. Maybe the developers didn’t think it mattered so much as you’re constantly legging it like a gazelle away from a cheetah (or a cow), but it’s pretty obvious that the visual design would be better suited to a smaller, iPhone-like screen. The effect becomes less like the grimy, lived in feel of Alien’s Nostromo and more like a multi-storey car park urinal. At least the music mixes it up a bit with some pumping tracks to accompany your relentless charge through the ship. Ranging from head banging techno beats to a more moody electronica these help to bring a bit of variety into the game, even if you’re too busy concentrating to pay much attention. Along this never ending journey is Riley, the steampunk-looking girl who broke you out of your containment unit in the beginning. She doubles as a guide and a dry comedic foil to your mute self. It’s always refreshing to have proper British voice acting in a game as most are saturated with those from North America. However, the delivery is a little shaky and doesn’t quite sound believable, taking you out of the experience whenever a stage is completed. The more interesting moments of the game nearly always have her disinterested voice putting in a pithy remark or two. I really like pith but there’s a time and place for it and Infinity Runner gorges itself on pith a little too much. 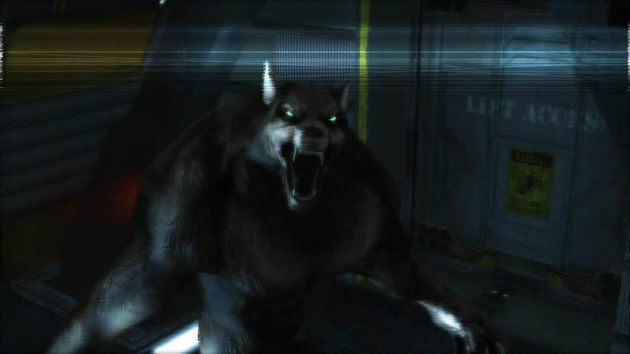 There’s power-ups here of course and a nice little twist is the ability to transform into a werewolf, allowing you to run faster, take little damage and override any QTEs needed to dispatch the visible-brained guards. It’s a cool touch but any deeper narrative is teased in a possible sequel and not explored enough to make its inclusion as cool as it sounds on paper. Infinity Runner does attempt to deepen the experience with a backstory, collectables that unlock descriptions of the ship you’re running in and some sort of character progression. None of this is enough to paper over the cracks of what is, essentially, a portable device arcade game on the PC. The Arcade Mode allows you to play any section of the game, minus the story, and there’s a raft of challenges that will ensure you’ll pull what’s left of your hair out after you’ve finished the story mode. For those looking for future-proofing their machine then Infinity Runner has Oculus Rift support. Though I can’t imagine the speed and jerky movement of the game translates particularly well for those with sensitive tummies, but I expect the thrill of playing this in VR would be pretty cool for the few minutes you could stomach. Infinity Runner is a strange beast. If this was a review of an iPad version then I would probably feel more favourable towards it but here, on the PC, a game as casual and potentially frustrating due to the nature of genre, feels out of place. Unless torturing your reflexive skills and muscle memory is a turn-on then Infinity Runner may be better left on the Steam shelf until it re-emerges onto a portable device. Either that or just run into a field of hungry cows and run like you’ve never run before - that's a real first-person endless runner experience. Infinity Runner is a strange beast. If this was a review of an iPad version then I would probably feel more favourable towards it but here, on the PC, a game as casual and potentially frustrating due to the nature of genre, feels out of place. Unless torturing your reflexive skills and muscle memory is a turn-on then Infinity Runner may be better left on the Steam shelf until it re-emerges onto a portable device. Either that or just run into a field of hungry cows and run like you’ve never run before - that’s a real first-person endless runner experience. Transforming into a werewolf and not having to bother with the QTEs.